Nevada Section Manager Joe Giraudo has announced the appointment of Gary Grant-K7YV of Reno to the position of Assistant Section Manager. Gary has been a ham since 1956 and has been active in virtually every area of emergency communications. The holder of a First Class Radiotelephone ticket with Radar Endorsement, Gary spent many years in commercial radio and in broadcast engineering. Proponents of the recent merger between the Wide Area Digital Group and the Sierra Nevada Amateur Radio Society predicted that the combined group would be a fresh, new club. It would appear that this prediction is becoming a reality. Last month the SNARS Board of Directors approved a new, modern logo as the clubs official identifier. Speaking of club activities, SNARS has an expanded schedule of licensing classes, as well as, follow up classes for newly licensed operators. More information is available here. The Race for the Cure supports the Susan G. Komen organization. The event which typically draws over 13,00 runners, saw those numbers dip to 11,570 at this years race. In its 18th year, organizers cited the bombing attack at the Boston Marathon a week earlier for being the reason that some racers stayed away. Association. There are four seperate touring levels of 8, 30, 65, and 100 miles each. In both events LVRAC volunteers provided Command Post and Check point communications, SAG vehicle operations, and tended to other support functions as they arose. The Eighth Annual Northern Nevada Swapmeet will take place on Saturday June 1st. at Brad Hollanders Ranch in Minden, Nevada. Minden is located about 15 miles south of Carson City. The frenzy for a deal begins at 7:00 AM. Sellers with large loads or big items such as towers, are welcome to drop their items off on Friday evening. Two well known Reno area amateur radio groups have overwhelmingly voted to join together as one organization. The memberships of the Wide Area Digital Group and the Sierra Nevada Amateur Radio Society frequently found theirselves working and playing together at the same events, and in many cases simply duplicating each others efforts. A blue ribbon panel of members from both organizations went to work and studied the pros and cons of the clubs merging. The result being that they recommended one larger club. The panel along with the Boards of both groups were able to draft the framework of a new organization, which will retain the name of Sierra Nevada Amateur Radio Society. The plan was submitted to their memberships. A secret ballot was cast and the results were tallied on June 1st. The initiative passed in both clubs. The old SNARS group had 100 members and WADG had 75 members. The new club will be a bit smaller than the 175 shown here, as a good number of hams were members of both groups. Mike Katz-N7MSK will be the President of the new organization. 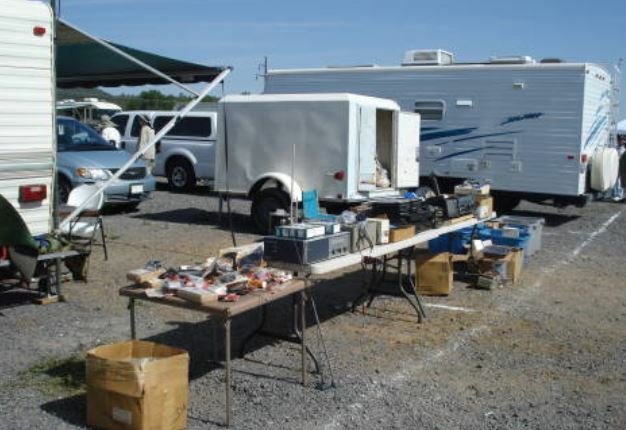 With no plans for a 2013 edition of EmComm West, three Reno area ham clubs organized a swapmeet and bar-b-que to fill the gap left in the spring amateur radio activities calendar. Nevada Reno Radio Club were all set to offer up three of the most popular elements from any hamfest: a great tailgate, a VE testing session, and a Bar-b-que-social. The activites were scheduled to kick off at 6:00 AM on Saturday May 4th at Sandy's Electronics. At the last minute, the Sandy's Electronics location was withdrawn. Insurance conflicts were being cited as the reason the hams got the boot, although other non-verified issues were being whispered about during the day on Saturday. Hasty arrangements were made and late Friday evening the swapmeet was moved to the parking lot of the Tamarack Junction Casino. Last minute e-mail notifications went out and sentries were dispatched to the entry of the business park in which Sandy's is located in an effort to re-direct attendees to the new location. The weather was cooperative. The pre-sunrise air had a cool snap to it as the event kicked off. Morning temps turned into moderately warm and sunny, shirt sleeve weather. The swapmeet was well attended, with buyers coming from as far away as Las Vegas. Trading activity was steady, with both buyers and sellers reporting good success. Free donuts were abundant at a couple of locations. Announcements and door prize drawings were handled by a very capable Emcee. parking areas. One security officer displayed a clear interest in ham radio and he inquired about testing, licensing, and what equipment to purchase. The last minute switching of locations forced the cancellation of the planned barb-que. But the casino's dining facilities proved a popular place for swapmeet hams to unwind and grab lunch or a late breakfast, while sharing in a bit of ham radio fellowship. Once again Las Vegas area hams will be able to find theirselves in Hog Heaven when they trek up the hill to beautiful Mt. Charleston for the seventh installment of the "Hams On The Hill" Field day event. The Mt. Charleston location was initially picked as an alternative to the broiling 110f temperatures found on the floor of the Las Vegas valley. With its 30 degree cooler temperatures the alpine forest of Mt. Charleston continues to have added benefits to those attending. Spectacular golden sunrises and a brillant night star show enhance the escape from the urban jungle below. Early campers arrive Thursday June 20th. Formal operations begin Saturday June 22nd. 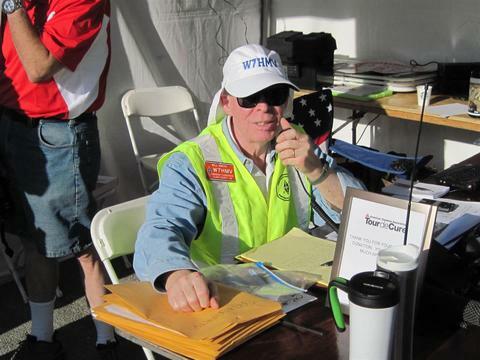 The Nevada amateur radio community is mourning the passing of Grant "Don" Carlson-KQ6FM who lost his fight against pancreatic cancer at 5:30 AM on Friday morning. Carlson, who was a noted broadcast radio personality, was extremely active in amateur radio activities and emergency communications. He held many club positions and ARRL field positions while living in California, including: District Emergency Coordinator for Monterey County, Section Emergency Coordinator for the Santa Clara Valley Section, and Santa Clara Valley Assistant Section Manager. Don and his wife Judy-KE6GIW moved to the Reno area in 2003 and he immediately began taking on leadership roles in the Nevada Section. These roles included: Assistant Section Emergency Coordinator, Northwest District Emergency Coordinator, Section Emergency Coordinator, and Public Information Coordinator. At the time of his passing Don was serving as Assistant Section Manager. Carlson also served the amateur community on the national level as a member of the ARRL's National Public Relations Committee. As a radio professional, Don was an on the air personality and Program Director at a number of radio stations in California and Nevada. Additionally, he owned and operated "The Voice Shop" a voice over business and his work could be heard on commercials and other venues throughout the country. Amateur radio operators would also be familar with the many on the air reports he made on the Amateur Radio Newsline. Don also was the Voice of EmComm West, having served as both the Master of Cermonies and as a member of the Board of Directors. The nv7av Radio Active Club has scheduled an amateur radio testing session for the Amargosa Valley on June 15th. The testing begins at 12:00 noon and continues until 2:00 PM at the Amargosa Valley Town Office, 821 E. Farm Rd. A "Celebration Of Life" service was held Saturday June 29th, 2013 at the Sierra Bible Church in Reno for Nevada Assistant Section Manager Don Carlson-KQ7FM. Carlson, who was 60, succumbed June 21st from pancreatic cancer. 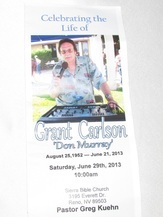 Amateur radio operators from several area states joined with Don's family and friends in a final salute to Carlson, who also was known by his alter ego, broadcast personality "Don Murray". As is typical of "on air talent" Don did stints with broadcast stations in several places, such as Fresno, Monterey, San Jose, and Los Angeles. Hams would recognize Don's voice from PR spots and newswire reports he did on behalf of amateur radio. Don was active in the congregation of the Sierra Bible Church. Don's friend and Pastor of Sierra, the Reverend Greg Kuehn officiated the service. The Silver State continues to grow in popularity among the worlds sporting enthusiasts. The combination of brilliant blue skies, majestic mountains, and desert beauty, coupled with extreme temperatures and rugged terrain, offer venues which challenge the body, while soothing the soul. Although Nevada's 110,000 square miles offer these World Class athletes the extreme environment they yearn to compete in, they also present unique logistical problems for the event organizers. Most notably is the lack of communications and of medical care. Both are absolute necessities in the world of extreme sports. In Nevada it is possible to be hundreds of miles from a telephone or from a medical facility. Simply stated, in most parts of Nevada without ham radio at these events, there would be no event. So lets take a peak at some upcoming events that need communications help from ham radio. 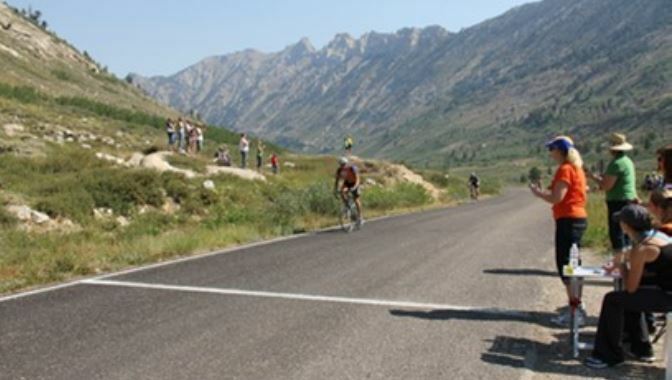 First up, the Lamoille Canyon Hill Climb, presented by the Elko Velo Cycling Club, 9:00 AM, August 10 in Elko. This well attended event is a grueling twelve mile bicycle challenge with a 3000' rise in elevation. If bicycling vertically up the side of a mountain for 12 miles doesn't get your heart pounding fast enough, you might give a whirl to the Ironman 70.3 World Championship triathlon in Henderson. Starting with 60,000 athletes from around the world, 1800 will earn a chance to come to Henderson and compete in the World Championship. Beginning with a 1.2 mile swim in Lake Las Vegas, the triathletes then bicycle for 56 miles before pounding the pavement for 13.1 miles of running. It takes 2,500 volunteers to make this event a reality. Circle Sunday September 8 on you calendar. Grab your radio and get in on the action. Dennie Little-KE7WOD will be happy to get you set up. 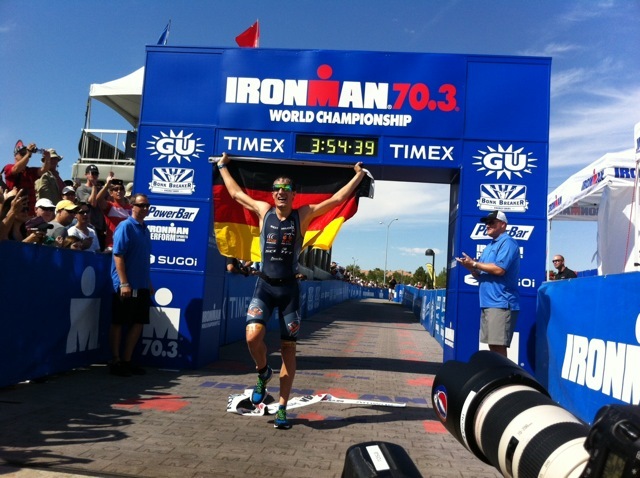 The full Ironman 70.3 story is here. Stick around for one more day and help out on August 25th with the first ever Reno/Tahoe Gran Fondo cycling event. Gran Fondo is Italian for 'Big Ride' and this one is 100 miles long. Jim Rosima and Bob Miller are also the guys you want to contact about this event. For those folks who like to bring it down and notch, while earning some cash for some very deserving charities. The Viva Bike Vegas event sponsored by Zappos.com and the Regional Transportation Commission might just fill the bill. This non-competitive event features 104 mile, 61 mile, and 18 mile fun rides on Saturday September 21. To volunteer contact Dennie Little. 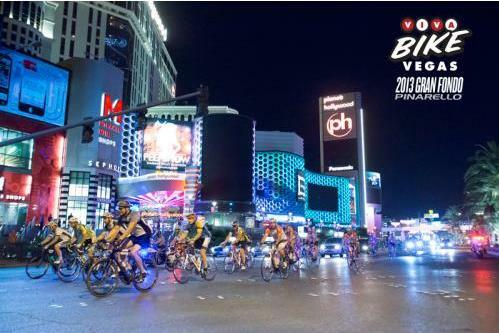 Learn more about Viva Bike Vegas. 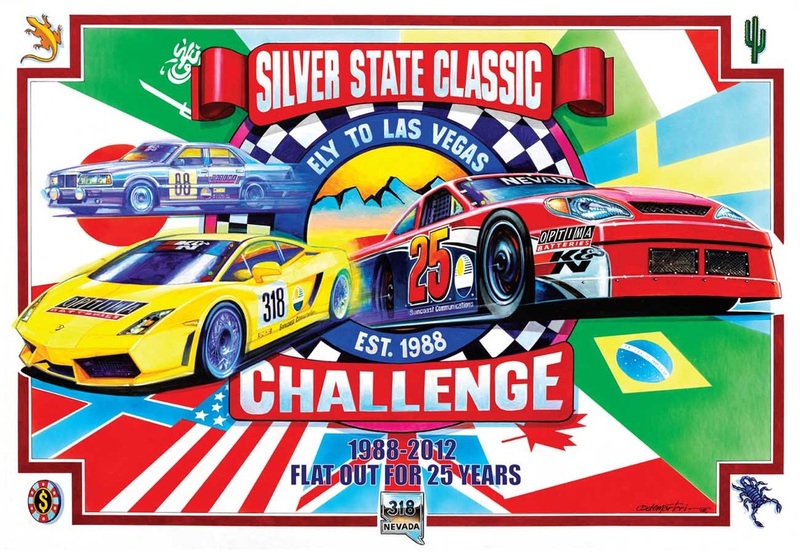 If "Muscle Cars" are more to your liking than "Muscle Men" then you might want to help out at the Silver State Classic Challenge. The un-disputed fastest highway race in the world (Guiness Book of World Records), now in it's 26th season, sees the pedals going to the metal in Ely on Sunday September 22. 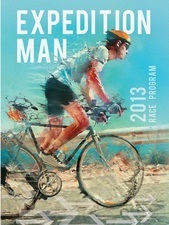 This race covers 90 miles of Nevada Highway 318 (officially the Silver State Classic Challenge Highway). Speeds have topped 250 MPH. One of the countries most successful space programs for young people the Arizona Near Space Research (ANSR) will be launching another of their high altitude projects on Saturday July 20th. The Arizona Near Space Research group works closely with NASA and with the Embry-Riddle Aeronautical University. The project has a high level of youth participation. This will be flight ASNR-76 and it will be launched from the ARCA/Williams hamfest at the Rodeo grounds in Williams, AZ. (35.258706°,-112.185012°). Liftoff is scheduled for 9:00 AM MST, (Nevada and other Pacific time zone stations please be aware that Arizona does not observe Daylight time, therefore the launch will also be at 9:00 AM your local time). The hydrogen filled, 1600-gram weather balloon is projected to rise to an altitude of 100,000 feet before bursting. Estimated flight time from lift-off to touchdown is two and a half hours. The flight will carry a number of the students payloads and full array of amateur radio related devices. Among these are both Fast Scan and Slow Scan Amateur Television demonstrations. Watch for FSTV on 434 MHZ AM and SSTV on 432.950 MHZ FM. A cross band repeater will be on board operating with a 2 meter uplink of 145.56 MHZ and a 70 CM downlink of 445.925 MHZ. A PL tone of 162.2 HZ will be used. Amateur radio operators may utilize the repeater for QSO's, but are asked to yield the frequency when needed by the balloon chase and recovery team. In-flight APRS beacons KA7NSR-11 and KA7NSR-12 will transmit positioning information on 445.925 MHZ and beacon KA&nSR-13 will be active on 144.34 MHZ. Additionally, the ANSR mobile Digi-peater will relay the APRS information on the standard APRS frequency 144.390 MHZ and will also be I-Gated via the Internet to trackers who may be out of the area. A full decade after skyrocketing costs forced the Amateur Radio Council of Arizona (ARCA) to abandon the Ft. Tuthill location in Flagstaff, the ARCA Hamfest continues to forge onward. 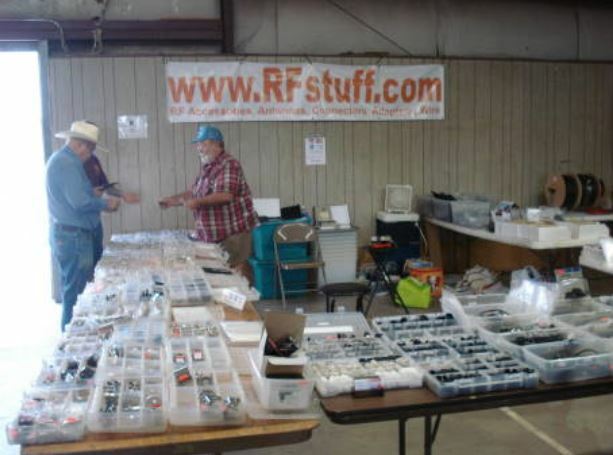 Beginning in the 1960's the Ft. Tuthill hamfest was the most popular amateur radio gathering in the Southwest. By the start of the new millennium Ft. Tuthill was under siege....by the Indians! An annual Indian Pow-Wow was growing and so was their demand for space. County park officials decided to exploit this demand and raised the usage charges to the hams to over $12,000 plus extra fees. As an example, if the hams wanted to slide a picnic table over they were only allowed to do this through the use of a parks department employee at a cost of $35. ARCA was forced to find another location. Ironically, the competing Indians only remained a couple of years and then moved the Pow-Wow to their reservation. The Bob Dean Rodeo grounds in Williams became the home of the ARCA Hamfest in 2004 and is still the host ten years later. The town of Williams and its residents have worked hard to make hamfest attendees feel welcome. A large number of southern Nevada amateurs are always in attendance and this year was no exception. as several dozen hams from Clark, Nye, and Lincoln counties were spotted. 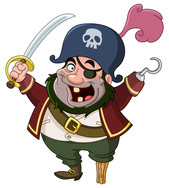 Many of us who were youngsters back in the late 1960's enjoyed "pirate hunting". It was a time when broadcasting was highly censored, especially in countries where all of the broadcasting was government owned and operated. Illegal broadcasters took to the air in a bid to play the latest rock and roll music, sell commercial advertising, and promote the use of mind bending drugs. Many of these illegitimate operations were from vessels anchored just outside the territorial waters of the nation to which their signal were targeted. Hence the name, "Pirate Radio". While not as highly publicized, pirate radio stations are still in existence today. Bored with the same old QSO's on 40 meters? Spin the VFO down a bit to around 3.9 Mhz and take a little look see. Here is a broadcast from Saturday evening of "Radio Free Whatever" on 3.945 Mhz at 01:55 UTC. WARNING: IT'S A PIRATE STATION, SO THE LANGUAGE AND CONTENT MAY BE OFFENSIVE....THAT'S WHAT THEY DO! American Radio Relay League (ARRL) Secretary David Sumner- K1ZZ has issued a "Call for Nominations" seeking candidates for the positions of Director and Vice-Director of the Pacific Division. Fifteen ARRL members comprise the Board of Directors, which governs the activities of the organization. held in five Divisions for one third of the sitting members of the Board. Geographically, the Pacific Division is the largest in the ARRL. The Division covers about 65% of the State of California, all of the states of Nevada and Hawaii, the Marianna Islands-including Guam and Saipan, American Somoa, the Marshall Islands, all island and US Territories in the Pacific, and all military bases having a AP postal address. Nominating petitions have been filed for both the Incumbent officers, Director Bob Vallio-W6RGG of Castro Valley, California and Vice-Director Jim Tiemsra-K6JAT, of Oakland, California. You can read the full biographical information on the candidates here. Full members of the ARRL are eligible to vote in the election, with balloting to begin October 1, 2013 and conclude at 9:00 AM on November 15, 2013. Additionally, any full ARRL member, who is at least 21 years of age, and who has been a continuous full member for the past 4 years may seek the nomination as a candidate for these offices. To nominate a candidate an official nominating petition, bearing the signatures of 10 Full ARRL members and completed by the candidate must be sent to the ARRL Secretary before 9:00 AM August 9, 2013.
frequencies in Northern Nevada that are assigned and not being used, Storey County ARES Emergency Coordinator Tom Taormina-K5RC said the following: "There are obviously many unused pairs in the region and many of them have been assigned to individuals or groups that have not put them on the air. This request is for anyone who currently has a coordin-ated repeater pair and would like to make it available for Storey County ARES, please contact me". Taormina went on to say: "We currently have a repeater on 441.625, PL 114.8, but we really could use a 2 meter box for maximum coverage and coordin-ation." Nevada's premier contest, the Nevada QSO Party, also known as the Nevada Mustang Round-Up took to the airwaves May 11th-12th. Logs were submitted and the scores have been tabulated. Overall high scorer and First Place in the Nevada Low Power-Mixed Division is Raymond Bass-W7YKN of Sparks, with a score of 13,248. First Place in the Nevada Low Power CW/Digital Category is John Bigley-N7UR of Las Vegas with a score of 11,562. First Place in the Nevada QRP CW/Digital Category is Ron Stark-KU7Y of Silver Springs with a score of 2,016. First Place in the Nevada QRP Phone Division is Lee Dusbabec-N7LD with a score of 32. First Place Overall Non-Nevada goes to John M Desloge, Jr.-N6MU of Cypress Groves, California-with a score of 396 in the Low Power Phone category. It has been fourteen years since the last commercial telegraph was sent in the United States. However, each year some of these station come to life during the annual "Night Of Nights" event. A Technician level "FastClass" is scheduled for Sunday August 11, in Gerlach Nevada,. Get your Ham License in Just One Day! Perseid Meteor Shower Campout Weekend! See the meteors, explore the Black Rock, soak in a hot spring, eat barbecue, and get a Ham License! Advance registration required for the FastClass! The $50.00 Class sign-up fee includes Saturday evening Barbecue and Friends Membership! Camping is Free. RV's and Trailers OK! people who took the class passed! That even surprised me!" Be sure to check out the Black Rock Amateur Radio Association by clicking on their Nevada Amateur Radio Newswire page.